Norwegian Alfred Fidjestøl is an awarded biographer and a non-fiction author with a keen eye for curious lives and institutions. Thus, it is not a big surprise that he has been the first Norwegian author to embark on yet another unusual project; that is, to write an animal biography or zoography about the most popular and well-documented animal living in Norway, the chimpanzee Julius, born, raised and kept in custody in Kristiansand Zoo from 1979 until today. What then is an animal biography? How do animals document their life? What is the sources of an animal’s life? In addition, who are the readers, probably not their kin, and why does anyone want to tell the life story of an animal? The structure of Fidjestøl’s biography is the chronological one, spanning from birth to the present, with an emphasis on the first half of the chimpanzee’s life, which is the period when Julius’ popularity was at its highest. Not only is the book title an open loan, referring to Robert Yerkes’ Almost Human from 1925, the various titles of the book chapters refer to literature, songs and films, such as ‘Happy days’ (Beckett), Four Weddings and a Funeral (Newell) and Home for Christmas (Mena). Interestingly, all these references are expressions of human cultural practices. 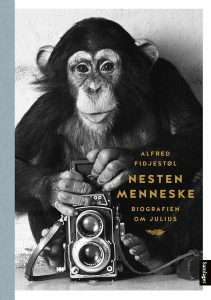 The main source to Julius’ life used by Fidjestøl are also human related; the medic’s journal from the first years, public archives, interviews with main caretakers of Julius, including the zoo director, photos, TV-programmes, and children’s books about the chimpanzee. In addition, he has studied seminal research on chimpanzee life, both wild (e.g. Goodall) and in custody (e.g. de Waal). It is interesting to note that what is less studied and discussed, is the animal biography genre, concerning both theoretical aspects (e.g. animal studies) and other animal biographies. At first glance and after reading the first chapters, one may get an impression that the biography is a homage to Kristiansand Zoo voicing the unpublished works of the medic and the director. However, Fidjestøl proves, in various and very clever ways, to be able to interlace critical comments, insightful perspectives on the anthropocentric human-animal distinctions, and questions concerning the rational of modern zoos. To the NaChiLitCul project, it may be of interest to study and perhaps question how Fidjestøl analyses the various ways Julius expresses himself. Except for the secondary sources (journals and both oral and written reports), most of the biographer’s knowledge seems to derive from photos, film clips and some paintings made by Julius. Julius himself is not represented by a human verbal language. Hence, Fidjestøl ends up reading Julius’ body language. His physique, his movements, his grin and, very often, his eyes. In addition, also the sounds or Julius’ ways of calling or yelling are taken in to consideration. The big problem, which is hard to solve, I guess, still remains; how do we, as humans, know how to interpret these means of communication? Shall we use human behaviour as a basis of comparison or shall we tune ourselves into or involve with animals as if we are about to learn a second language? According to Fidjestøl, the act of looking into the animals’ eyes seems to be a key possibility. Leaning on Martin Buber (in addition he could confer with Levinas), he tends to mystify the gaze of the chimpanzee. What is perhaps most important, he also stresses that when looking into the eyes of the chimpanzee, he also finds a plea for respect, and a call upon us as humans to stop massacring and eradicating the many species and forms of life around the world.